This story/interview was found in the April/May 1979 issue of 'The Write Thing.' It was written by Henrique Filho. George gave a press conference at the WEA offices here on February 7, 1979, at around 2 pm in Rio. My wife and I managed to be present and were lucky enough to record his interview, take some photos and film him in super 8mm. Here is the interview George gave to a local TV station. Q: How do you feel about the constant approaches regarding a Beatles reunion? George: I think it's a waste of time. Q: Because of your involvement with the Hare Krsna movement you've influenced a lot of youngsters everywhere. What do you think about that? 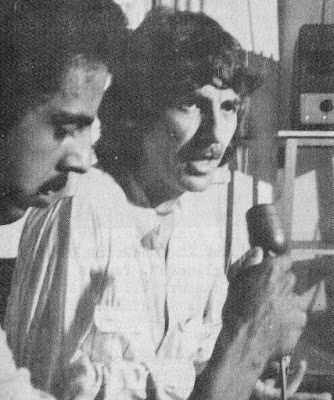 George: I think it's very good because first of all Krsna is one name for God. So there's only the same God, it's like what we call Buddha, Allah, Jehovah, Krishna so there are many names. Krsna is the divine energy we should plug in and so you chant Hare Krsna, Krsna, Krsna, Krsna, Hare Rama, Rama, Rama and if you chant it millions of times you feel great. Q: What do you know about the Brazilian people and its music? George: I don't know too much about the music other than what I've seen about the Carnival on TV. I've heard about samba, rumba, you know, this sort of thing and about the fields. It's very much like India, the same hot (at this he shook his shirt), smell and the same flowers, trees, fruit, vegetables, you know, very similar. Q: Please, tell us something about your new album and the song "Faster", it is really dedicated to J. Stewart? George: One of the songs on the new album is "Faster", inspired by Jackie Stewart and Niki Lauda, you know Formula 1 motivates it and the song is also in the memory of Robbie Peterson. All about the Formula 1 circus and what happens to people. Q: Is there any real possibility of some concerts here, in Brazil? George: Maybe, because one reason I came -- used the Grand Prix as the excuse to come and see Rio and a little bit of Brazil, you know, it's like a test to come and see what it is like and I didn't realize it was so interesting. So I think it's a good place to come and maybe I'll come late this year or next year. On the same day, George returned to Europe by the Concorde. During the press conference, George was wearing jeans, a white shirt and arrived with his glasses on. All the time he was very nice and gentle. He signed some records for us and we gave him a present for Dhani. It was great to see George and to talk to him. Late that night we remembered it was February 7th, the day you were completing your 15th Beatles anniversary celebration, the same day we saw our first Beatle here in Brazil! Henrique was a good friend of mine. Sadly, he passed away years ago of a sudden heart attack, right in front of his lovely wife. Klaudia and I are still friends, she might be able to add to this narrative. I will send her the link.